Chroma ATE announced its new 17020 Regenerative Battery Pack Test System for secondary battery module and pack test and features a regenerative energy discharge design. Oct. 26, 2011 - PRLog -- Chroma ATE, a world leading supplier of electronic test, measurement and manufacturing equipment, has announced its new Chroma 17020 Regenerative Battery Pack Test System. The Chroma 17020 System is a high precision integrated solution specifically designed for secondary battery module and pack tests. Accurate source and measurement ensure the test quality that is suitable for performing exact, reliable testing crucial for battery module / pack incoming or outgoing inspection as well as capacity, performance, production and qualification testing. The Chroma 17020 system architecture offers a regenerative discharge energy design to recycle the electric energy sourced by the battery module / pack to channels in the system per- forming a charging function or back to the utility mains in the most energy efficient manner. This feature saves electricity, reduces the facilities thermal foot print and provides a green solution by reducing the environmental impact on the planet. The Chroma 17020 System is equipped with multiple independent channels to support dedicated charge / discharge tests on multiple battery modules / packs each with discrete test characteristics. Channels may be easily paralleled to support higher current requirements. 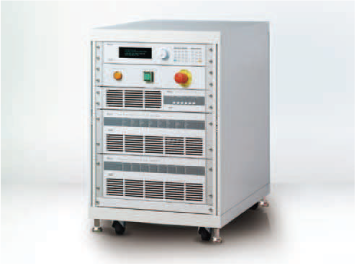 This feature provides the ultimate flexibility between high channel count and high current testing. Advanced driving hardware can create seamless transitions between a maximum charge to maximum discharge (or maximum discharge to maximum charge) with a rapid 10mS conversion. This feature allows for charge/discharge modes simulating real world scenarios. The Chroma 17020 System has flexible programming functions and may be operated with Chroma's "Battery Pro" Software. Battery Pro utilizes the system to create cycling tests from basic charge or discharge to complex drive cycle testing for each channel or channel groups. Thermal chamber control can be integrated into a profile and triggered by time or test results yielding a dynamic profile. Battery Pro's features allow quick and intuitive test development eliminating the need of tedious scripting or programming by a software engineer. Multiple safety features are standard including Battery Polarity Check, Over Voltage Protection, Over Current Protection check and Over Temperature Protection to ensure protected charge / discharge testing. In the unlikely event of power or computer communication loss, data is securely stored in system non-volatile memory protecting against potential data loss and allowing for continuous flow after restart. The Chroma 17020 is available for preorder directly from Chroma ATE, Inc. with delivery beginning in Q1 2012. To preorder, visit Chroma’s website, http://www.chromaus.com, or call 1-800-478-2026.